There was once a very wise old man who told me ‘He who has nothing has everything’. That was my Tadcu (Welsh for Grandfather). He believed that a person who has nothing is more ‘whole’ and able to truly understand the great things in life given to a human being, rather than the materialistic items so many of us have and the money in our pockets. I never quite understood what he meant until I went to Ghana for Independent Thinking Ltd & the Big iFoundation back in 2014. 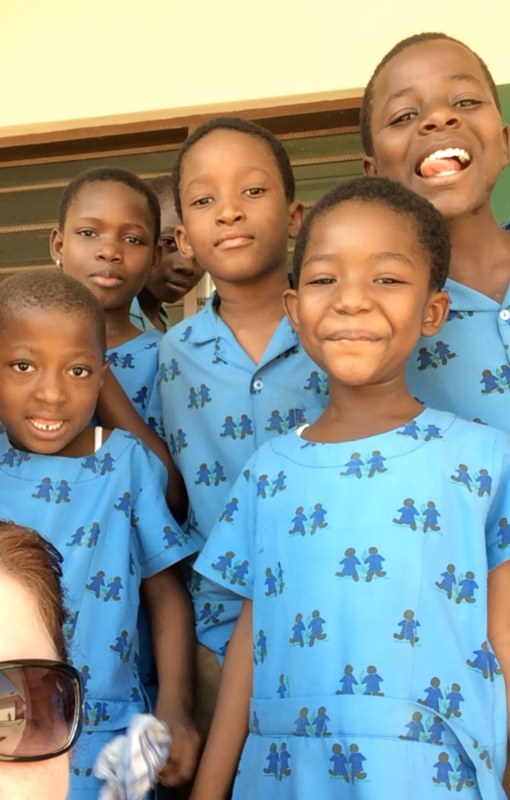 My Ghana work literally changed my life. The whole experience. I will now take you on part of my journey, to experience a little of what I did as my two amazing colleagues and dear friends at Independent Thinking – Lisa Jane Ashes @lisajaneashes and Crista Hazell @CristaHazell will continue the work I started in Ghana a couple of years ago. It’s all about getting #Naked4Ghana and taking part in the #NakedTeachingDay on 30th September, 2016. Ditch all resources and just be YOU. YOU, the teacher who will create ‘Something from Nothing’. 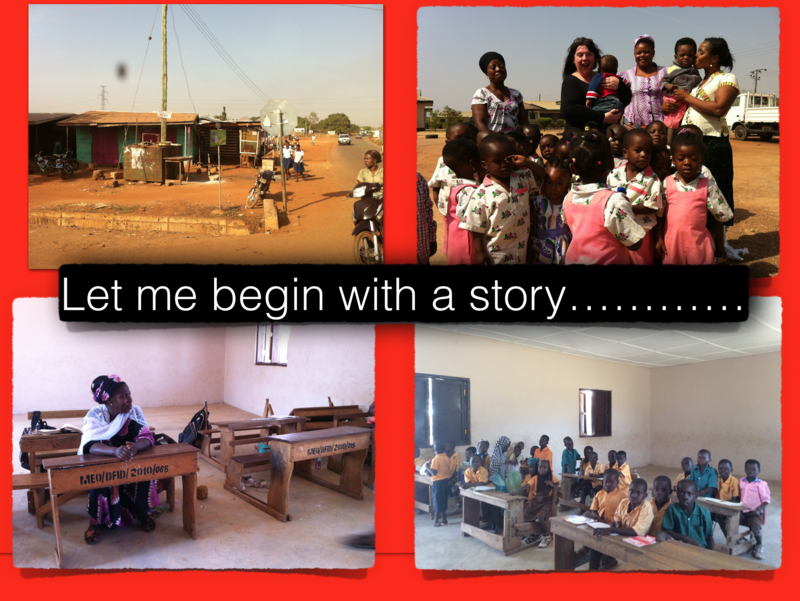 Here’s a little of my story when I was in Ghana. I was alone in a strange country, trying to make a difference, the biggest difference I think I have ever made. I had a few hours every evening with a borrowed laptop and a USB stick that connected me with the ‘outside’ world – the world as I knew it. It began in Tamale, Ghana. A very special place which will remain in my heart, forever. The Teaching Staffroom – under a tree. Will you complain again about yours? What you are about to read are my daily reflections. They were my way of trying to share what I was seeing, feeling, smelling and experiencing. Words will never do it justice. My way of trying to connect with others when I was alone and maybe a somewhat lonely in the evenings, but full of joy at the same time. 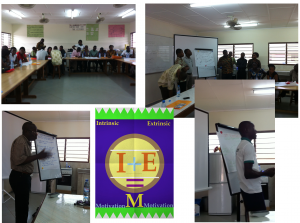 27th January 2014 – Notes from Tamale, Ghana to my colleagues at Independent Thinking. Here’s hoping the limited internet connection in a very rural Ghana gets to you all. Arrived safely last night and had a few hours sleep before a 4am pick up. A flight from Accra to a rural part of Ghana – Tamale. It is a very hot 36C here and very, very dry. Good for the old ‘Uncle Arthur-It is’ though!. I am staying in the SOS Children’s Village, Tamale which is an incredible place in itself. A purpose built little village with houses for Orphan children. In it a school, ‘Mama & Aunty’ Houses which have an average of 8-10 orphan children in them. 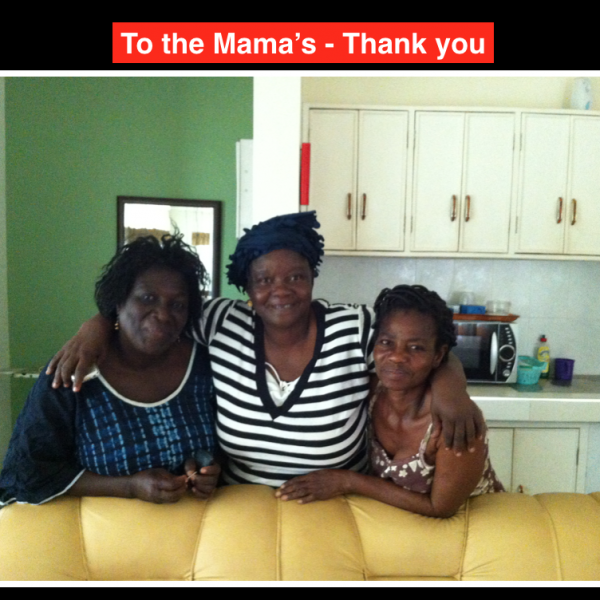 The Mama’s are the main carers and anyone else is know as an Aunty. The Mama’s & the Aunties. The Director of Village (Christopher) is known as their ‘Father’. I am staying in one of their Guest houses, very, very basic but fine. I went to the Crèche today and had little children stroking me feet, pull at my trousers and calling me ‘Mama’. (The most incredible experience ever) I have the pics to prove which I will share once I can get onto wifi (maybe that will be at home) but that’s all to come. I visited Zoozugu School – my mouth was agape. The truck which was my mode of transport bounced and clattered as we travelled the mud track there. Red dusty earth with ant hills like architectural monuments raising from the ground. Classrooms like you’ve never seen – some with only three small desks – they have NOTHING but themselves. They care and love of their teachers. They are children who are smiling and laughing. The SOS school in Tamale is pretty well equipped with furniture compared to Zoozugu. It’s like something you would see on the Discovery Channel – but for real. Words fail me to describe the deprivation. Yet the loving happy children laughing and running in the dust of the red earth create the loveliest of sounds. It’s very,very special. In Zoozugu, children run up to me, then running away laughing. I’m like an alien to them, their curiosity is obvious. The musical sounds of goats in the same playground make me laugh, but it’s all part of this school. A school with children, teachers and goats – probably a few other creatures too which I haven’t yet identified! Classrooms which resemble mud huts. They so need our help in so many basic humanitarian ways. I am not even into the first full day and my heart is full of joy, but sadness too, I will go home to ‘my place’ and KNOW that I will want to throw the materialistic things away. This is indeed the beginning of a very beautiful learning journey for us at ITL and Big iFoundation, a partnership and a journey. NOTHING can prepare anyone for it. All the nonsense of the politically damaging education system we have in the UK has no place here, it’s about nurturing human beings to have the passion and confidence to face that ‘OTHER’ world we know. They want to escape what they have. They have HOPE in their eyes, in their voices and in their hearts. I saw lessons today in the Village school that would put some English teachers to shame. Children as young as 6/7 showing the difference between Nouns and Pronouns, but unfortunately all teacher led from the front. However, a breathe of fresh air seeing children chant and clap. When a child is asked a question and stands up, they all clap. They all spoke with utmost confidence, even if the answer was wrong or ‘not quite there yet’. Tomorrow, I will run a workshop on practical strategies for motivating children to be independent learners. Working in groups and pairs, not just sitting behind desks. It’s a learning relationship. This might seem like an everyday strategy for you but for these teachers and children it’s alien. Unheard of. It’s been a tiring day, yet my heart is so full of joy and hope. My promise to you all is that I will do my utmost best to make a difference. Observe the impact and gather the evidence. It really would shake you emotionally if you could see and feel the issues here, but a joyful spring in your step would come once you were able to feel the hug of 14 Kindergarten children all trying to tell you something in one go. This is a first at the SOS Village. Some of the older children ran to me after school and asked if I was on Facebook. I said yes. Can we be your friends so we can keep showing you the work we will be doing? I bet you can guess my answer. I did check with the Headteacher Daniel Baani, if this was acceptable. They see it as a connection with Western Education. These were older children that came to my door. The ones that ‘pay’ to attend the SOS school. They have a computer at home, but not those children in Zoozugu. They have red earth and nothing else. Enough for now, I just wanted to give you a flavour of what is here and ahead. It is indeed the most humbling of experiences and a privilege to be here flying the flag for ITL and the Big iFoundation. I have borrowed a PC little laptop and a mobile dongle, So, will try and check-in again tomorrow. Hope you are well ? Big smiles, huge cwtches for you all. 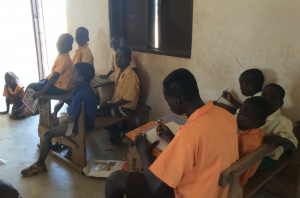 Here are my tales of Day 3 in Ghana. Thanks to you Ian, for tweeting and passing on my messages due to the limited connection. 6.30am – I rise to the sound of children laughing and goats screeching. A hot 28C at this time of the morning. 8am – I am driven across the dusty red road to a place which is barren with little mud hut houses all in small circles. Yes, I am returning to Zoozugu today. A large opening with two buildings which houses ‘Zoozogu School’ serving the poorest and ill children of the community. As the truck drops me off some of the smallest children come running up as they remember me from yesterday. This is a whistle stop tour and the quick look at the school before my adventures later today across at the SOS School and Village. The children blow kisses to me with their tiny little hands and their big dark eyes encompassed by electric blue circles which I am told is a blinding disease that these children have, it pierces my soul. For some the flies stick at the side of their eyes and they still smile and cry ‘Helloooooooooo Mama’. So many tug at my trousers and touch my feet, mesmerized by my little black shoes as some have none of their feet. I am welcomed by the Zimbabwean Headteacher – he is a tall stern man with the deepest of voices. Time to begin lesson observations at Zoozugu. In the first classroom I enter a sea of children. They quickly stand up from the concrete floor. They chant together. “Good Morning Madam, how are you?” I say how very happy I am to see them. I ask them how they are and they all chant back like a single voice from the read earth .’We are fine’. They are trained to respond to anyone who enters with the same greeting. Children sit on the dusty floor, while the serious shortage of wooden benches houses about 5 children squashed together like Sardines. This is a large class of children who are learning about Animals in the community. Snakes, Crocodiles, Cats, Dogs, Goats, Rats, Bats etc. They are taught by rote to repeat the names and types of animals they are. Children do not misbehave, but they are not engaged just learning like robots, until the teacher asks who has a cat. Almost all jump up. Their eyes light up and they smile as they all say “me me me me me”. Of course they do because they have wild cats everywhere! Making ‘it real’ has suddenly got the students engaged. Boys answer questions here more than girls, an interesting observation. And, the boys are keen to compete against each other for ‘Stand and talk’ responses. 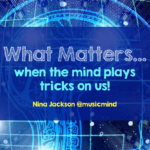 Over 80% have nothing to write on…no paper, no pens, just sit, listen and respond. The chalk dusted board has seen better times, but this young teacher now has no more chalk to write with, what will he do? In fact, this became a better lesson as he interacted with the children more. These children are trained to just answer a question or repeat words by rote. I feel so sorry for them and yet I feel happy for them as they have a teacher who wants them to do well, but they have nothing, except each other. I need to help, I need to give them hope to be independent and know their voice and their thinking will count in the world. Hopefully the workshop this afternoon will give this young teacher strategies to use with the children. I am still amazed by what I see and hear. 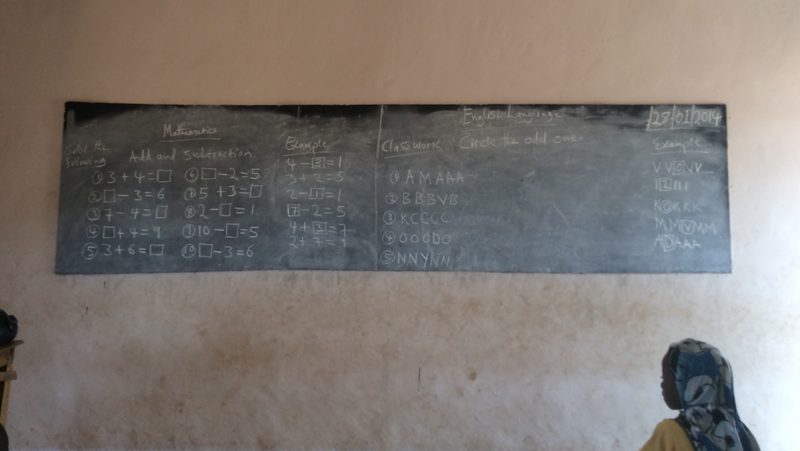 A smaller classroom but the old blackboard is split in half. The ages range from 6 to 13! The teacher tells me half the class are doing Maths whilst the other half are doing English. On the English side I see 1) AAAMA 2) BBBVB 3) CCCJC the children had to name the letter which wasn’t the same as others !!!! Unreal in ‘our world’ of Learning and yet so real for these children. The teacher is an unhappy teacher who has a stick. A curved branch from a tree. This stick is NOT used for the board, but when he has it in his hand I have that ‘dreaded feeling’. The Headteacher is trying to teach them about Conjunctions! 75% of them can’t read what is chalked on the board. They have a choice of two words to complete the sentence in English. The Headteacher himself can’t spell the words correctly and yet the children are being asked to complete the sentence. One boy stands to read. His voice loud and clear reads “Amina is late home as she has to wait _______ the rain stops’ (till,but)” – he reads it. The Headteacher has written ’till’ rather than ‘until’ but the child read “Amina is late home as she has to wait dash the rain stops bracket till but”. The teacher asks what is the word he reads again. The teacher (The Headmaster) shouts at the quivering boy “it’s simple. READ it boy”. He sits and puts his head on the desk both in shame and with distress. I quiver too. I cannot watch this anymore. I ask the Headteacher if I can take the lesson. Try something different, so I did. He allows me the space and the time (as it means he can leave!) I take the class and I unravel all the work and get the children out of their seats. We create the sentence by what sounds correct firstly, giving children a words to place together. You move, I move, we move strategy. I am told by the children they are not allowed to move from their space. 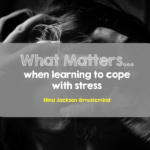 I reassure them it’s fine and give them a big smile of security – you’ve got to ’feed the heart to feed the brain’, make them feel emotionally safe for learning. We work together and the whole class gets all the sentences correct. Then enters the Head. He demands that if they have books or paper they write it. He is not sure how to respond to me !!! Who cares, the children are happy and have achieved what he asked them to do, but in a different way. Difficult, but for me it’s the children that count. #thereisanotherway every single time. At break, I watch all the children run to the big pot of food cooked in a wooden shed by some smiling ladies dressed in the most beautiful African print cloth. Goats are everywhere. Each child has one small bowl. They collect some beans and a red type grain. They eat with their hands and they offer me food. They have nothing, but they still want to share. I did not want to offend (as they pleaded to me to share their food) so I took the tiniest of food in my fingers as a thank you. I had the biggest of smiles and I sat in the baking heat watching these children eat with the occasional Goat roaming here and there amongst them all. The sound of laughter and children running still rings in my ears. What was to follow was magical. I went into a Kindergarten class where the children were chanting and singing numbers off the board. A small child was pointing at the board saying the letter or number and everyone copied. The musical sound of their voices was wonderful. (Videos to share upon my return). I knew this was the closest I was going to see with regards to student engagement and participation, and yet the sounds of their voices echoed across the barren land like the dulcet tones of angels’ voices. What I saw, heard and felt at this school ranged from rage and anger to euphoric moments of joy. These children need so much help, as do the teachers. Their staffroom is an open space under a tree. There are no sanitary facilities and no visible running water. 12pm – I return to the SOS Village school seeing the most amazing artistic ant hills, even more than I had seen earlier. They are amongst the trees that are burnt. They are like the work of Gaudi in Barcelona. It is now a basking 38C at 12.30pm when I begin my first teacher workshop with those from Zoozugu. They have sent the children home early. I thank them for allowing me into their lessons and so I begin. Two hours of hard work sharing with them strategies to engage the children in a practical way. In the session I ask for no paper or pens or anything to be used. This was the beginning of ‘Something from nothing’ – after all, if you have nothing you have everything. 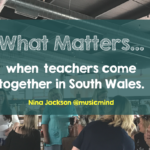 Your thinking, passion and innate ideas to make learning connections with others. A good session. Teachers felt embraced with new ideas. We (in the western world) would call them simple, but for these teachers they were great. They could teach differently but with nothing. They could create something different from nothing. They could make learning come alive – with something from nothing. I told them they needed to give the children ‘permission’ to move, work in groups and pairs and be motivated with ‘real life’ learning as well as the knowledge & facts they want them to learn. They leave quite excited, although tomorrow’s return visit will be the proof of any impact. A brief break. Into Workshop 2 with the teachers from SOS Children’s Village. What a difference. Embracing change and practical ideas. The Head saying that it is not right for children to be bored in lessons, (yahoooooo). A great amount was achieved during the session and the practical methods I showed them how to get children ‘doing’ things was most welcome. 5.45pm – I close my workshop, teachers are very tired in the heat. They have been teaching all day and then had to put up with me. They are elated with prospect of trying out new ways of learning and teaching. 6pm – Review of the day with the Headteachers. The lady who brings the food to the Guest house asked me today did I like ‘Phoo Phoo’. Not sure if I heard correctly so I said ‘pardon?’ “You like phoo phoo?” I wasn’t sure how to respond !!!! She then told me it was pulped Plantain with oats – phewyyyyyy – and there was me thinking something else! It’s late now. The children of the village still playing in the darkness and the sound of laughter makes the world a very happy place here in Ghana. It is the most wonderful of places and so much for us all to learn about the creation of a special Community for children who need a home and a loving family (The Mamas), and the Medical Centre which had about 50 ladies queuing for Cervical Screening today was also a sight. 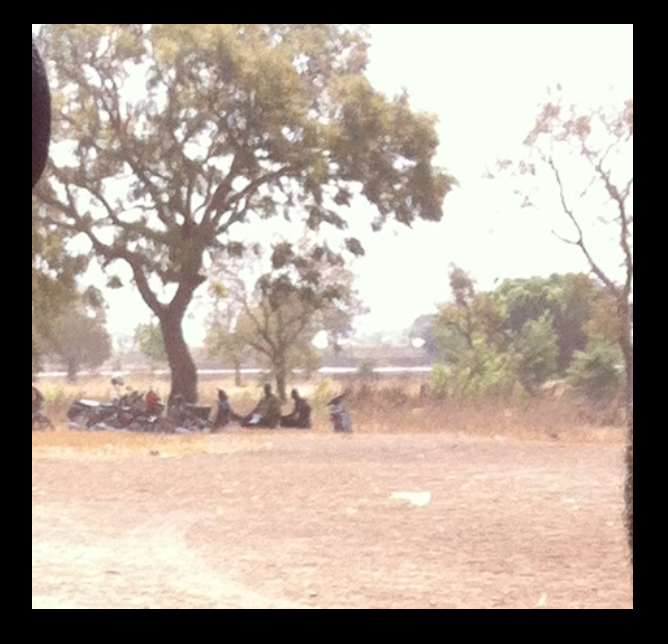 Children sit under trees as the heat drops, singing songs and playing with sticks. I now close my thin curtain lay on my bed and listen to the wonderful sounds around me. I am blessed. I am alone. I am happy. Tomorrow brings more tales, but this evening I send you all my top Ninja smile and thank you for being part of my journey. Proud to be representing ITL and Big iFoundation. No, it’s not the heat getting to me it’s the hysterical laughter I greet myself with in the morning when I realise I am amongst weird and wonderful things that would never be in Craig-Cefn-Parc, but are definitely here in Tamale, Ghana. 7.30 am – Greeted by the wonderful ‘Esther’ who is one of the Mama’s in the Village Houses. Not only does she care for 9 orphan children, she has been cooking food for me all week. Today I am blessed with more authentic African Cuisine which seems to be the most delicious food I have eaten – fresh from the ground. They won’t let me lift a finger not even wash the dishes – it’s their way they say, which is an appreciation in itself. The two Headteachers arrive – Daniel from this SOS Village and also Steve who is from one of the other SOS Village Schools in Ghana. The day is revised. 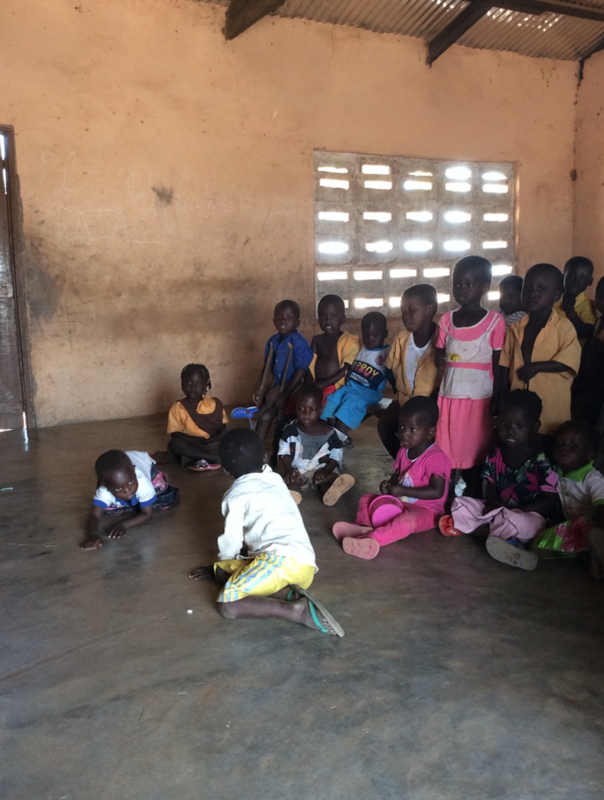 Lesson observations in the Village school 8.30am – 12.30pm, then 2nd round of workshops for the teachers from Zoozugu school 12.30pm – 2pm. Lunch. 3pm -5.30pm workshop 2 with SOS Teachers followed by a meeting with the Headteachers. It’s busy but brilliant. I am now like an adrenaline junky running on the enthusiasm of the teachers, and most importantly on the children. Lesson Observations at SOS Village. Today I observed more lessons than I could count. Taking in as much of the learning as I can. Maths, Dubani lessons (the local dialect), French, English, Social Studies, Basic 1 – learning how to weave and do laces, Kindergarten (3 classes) and break surrounded by the most wonderful children all offering me dry crackers, a grit type food, juice, water and anything else they can share. 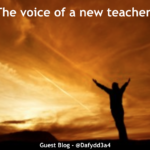 I was motivated by the some of teachers I observed who had overnight decided to implement some of the more practical strategies I had introduced to them yesterday – ‘Give me 5′,’Link it – Share it, Squeeze it, Pump it’, ‘What if?’, Peer Assessment and much more. These are teachers who are used to didactic teaching and children repeating terms, responding to questions (only hands up allowed) and writing in books. I was really encouraged by their willingness to try new things and the learners embraced them with joy A very new way of learning for some. It’s like an opportunity to experience a freedom of expression talking and working in groups. 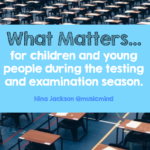 Children were initially confused why they were allowed out of their seats and slightly apprehensive but coped well with the change, many with a spring in their step and wanting more. It was clear to see that small steps can definitely make very big footprints in the snow, even the red earth of Ghana. Break time brought curious children to sit or run around me as I sat on a hot concrete ledge, soaking up the baking heat and smelling the earth around me as well as children laughing, screeching and just being children. 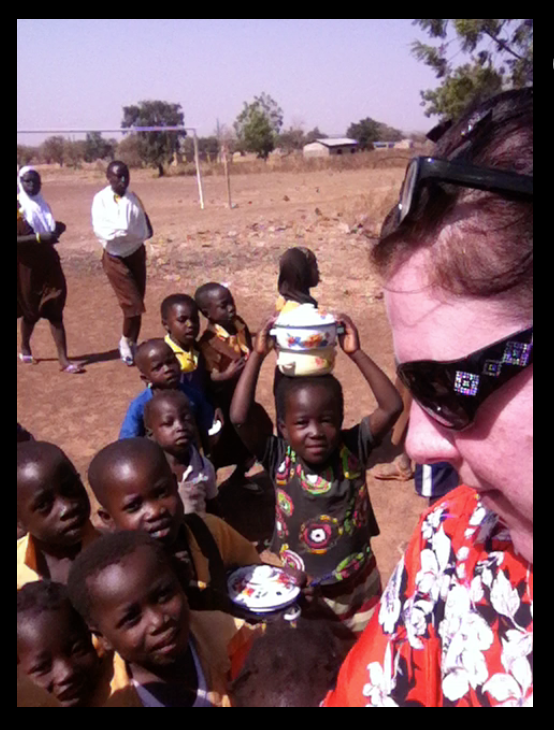 They were fascinated with the iPad camera especially as they could see themselves when I videoed them! The rumour quickly spread across the school that some of them were going to be on the ‘TV!! !’ (How wonderful). There was some quirky face pulling as well which brought great sounds of thrill and excitement to so many. The beating of the tin cans sounded the end of break and they scurried away like little tiny ants to their nests. Like the thousands of tiny tiny brown ants which decided to invade my bag and arms yesterday – although the children don’t bite like these ants do!!! The end of break brought more fun. I sat in a Dubani lesson and watched the children and teacher sing work songs and learn how to call a market stall trader to sell them a little soap. I have much to learn about the local dialect, but I will be ok to buy a little square of soap – maybe! The 2nd workshop today with the Zoozugu teachers was indeed a better one than yesterday, even though the Headteacher did not initially join in the task until I did my ‘Ninja thing’ – gently moving in his direction, touching his arm and making a joke about his great strength as a Leader of which his teachers must be very proud. Did the trick. They left after an hour and a half exhausted with my ‘need’ for them to participate in a practical way. No pens or paper or anything again today. We continued the theme ‘Something from Nothing’. The Zoozugu teachers really are working in the most dreadful of conditions. No books unless the parents can afford to buy a simple exercise book, but then no pens. I may need to visit the market myself, not to buy soap, but basic equipment we all take for granted every day of the week, but it’s like gold dust for them. 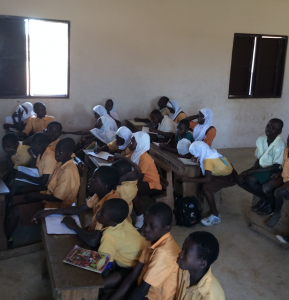 This is the school where some wild goats often roam into the classroom and no one blinks and eyelid…it’s just accepted. Oh yes, there is an outbreak of Chicken Pox in the village, just something else for them to cope with! Workshop 2 with the SOS Teachers is a total triumph. Wow. Teachers embraced the ‘Ninja’ way of thinking. Engaging ALL learners and identifying what makes Independent Learning. Strategies to nurture Independent Learning and Thinking and ways of getting children to research, gather information, consolidate and present in a way which allows them to be themselves – Independent Learners. So much Pedagogy to explore. None of them aware of what a Mind Map is. Emotional Intelligence was something they had never heard of either. But, that’s fine as these are the teachers who are thirsty for all that I can give them, share with them and allow them to try. I suggested to them that they need to give themselves ‘permission’ to try new ideas, as well as engaging learners in a creative and practical way. The Headteacher is so supportive of this. He is blown away but the excitement in the room. Today’s session was so good I shared a bag of my favourite sweets. I gave them to the teachers. They’d never had sweets like that, they were Midget Gems (Emergency food rations of course!) They challenged themselves to solve my learning equation ‘I + E = M’ (Intrinsic + Extrinsic = Motivation – now a chapter in ‘Of Teaching, Learning & Sherbet Lemons’. I come away from the workshop exhilarated and exhausted at the same time (heat mainly, nothing else) and I reflect on what was ‘a cracking day’. I return to the Guest House where children come and knock on the door. They watch my every move as I walk across the village, losing myself in this wonder that is around me. They love a nose around, curious, wanting to question and secretly, they come for a Ninja cwtch!! We laugh, do crazy dance moves and just be silly together, what joy. Luckily, the M&S Rose Deoderant is doing it’s job, otherwise I could be in the slightly ‘whiffy category’ – thank you M&S. To sum up the day. Exhausted, but pure joy and magic everywhere. I hope you are all well, and thank you for some of your personal responses to my journey so far, I’ve lost track of days, dates and even where I REALLY am. 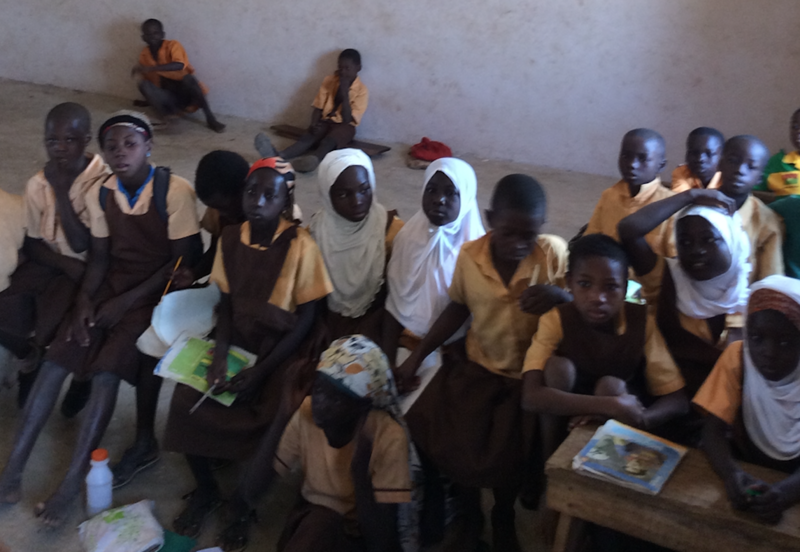 Reality check – yes – Tamale,Ghana. Over and out for now. More tomorrow. These were my emails I sent to Ian Gilbert at Independent Thinking and they are just a flavour of what I experienced in Ghana as I don’t want to give the whole story away – I’m sure there’s a book in there which I will no doubt write one day. 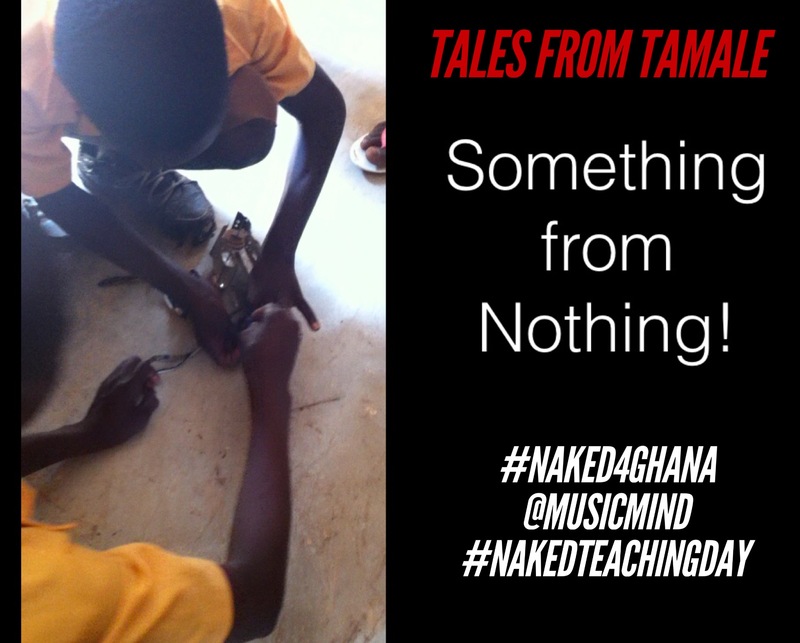 The story of ‘Something from nothing’ shows that you CAN get #Naked4Ghana and toss away your worksheets, digital devices, pens, paper and anything else you take for granted as a teaching tool and do it all the ‘Zoozugu & SOS’ way – they way they only know, with nothing. Here are some pictures and a few videos for you to get a flavour of my experience. I hope you will support our work at Independent Thinking and the new collaboration we have with WWEP. It’s important we have an understanding of Global Education and the International perspective. Here’s wishing Lisa Jane Ashes & Crista Hazell the best of luck in Ghana representing us at Independent Thinking and WWEP. May the Guinea Fowls be with you. Join us for #Naked4Ghana and #NakedTeachingDay on the 30th September 2016. I’d love to know your thoughts so please get in touch.